The Oskia Renaissance Cleansing Gel is my go-to cleanser in the mornings as it not only removes grime and impurities, but it is full of brightening vitamins and Pumpkin Enzymes that gently remove dead and dull skin cells. I love taking the time to massage the rosy scented, gel to oil formula into my skin; once removed, my skin looks fresh and rejuvenated. It's the perfect start to my morning skincare routine. For a more thorough exfoliation, I reach for a liquid exfoliator such as the Pixi Glow Tonic. It contains Glycolic Acid and Ginseng, which are ingredients that are super effective at removing dead skin cells. Ginseng also encourages regeneration of existing skin cells by improving blood circulation and increasing oxygenation. I find that with daily use, this toner gives my skin a healthy, natural glow and helps to reduce breakouts and scarring. This Ole Henriksen serum is described as "a daily vitamin for the face" and I really do agree. 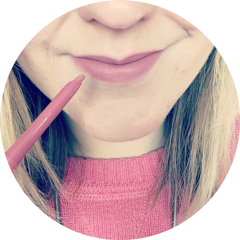 The formula is lightweight and absorbs quickly yet I can see a subtle but noticeable difference to the tone of my skin within seconds of application. Not only does it provide moisture and strengthen collagen with a Vitamin C complex, but Grapefruit and Orange Extracts deliver on the illuminating front. If you have oily/combination skin, then this gel-cream hybrid is the perfect morning moisturiser to deliver the right amount of moisture without being heavy or greasy. I wouldn't say that it is particularly brightening, but Panax Ginseng and Coffee Bean inject some life back into the skin and stop it looking less lacklustre and more healthy. Plus the zingy orange scent is just lovely. This 98% natural, triple action mask only needs to be left on the skin for 5 minutes to do its magic; kaolin clay draws out impurities, a fruit acid complex brightens the skin and ground walnut spheres gently exfoliate. Sweet Almond Oil, Lavender and Roman Chamomile also work together to soothe and hydrate. Using this at the end of a makeup free day makes my skin look especially amazing and I can still see the glowy effects the next day. What are your skincare saviours for dull, tired skin? Collagen booster you say? I need me some of that! I just got a mini sample of that Ole Henrickson serum so can't wait to try it! I think the Balance me is the only product here I haven't tried but love the others! You should try Oskia's renaissance mask to go with the cleanser, really good! Lovely post! 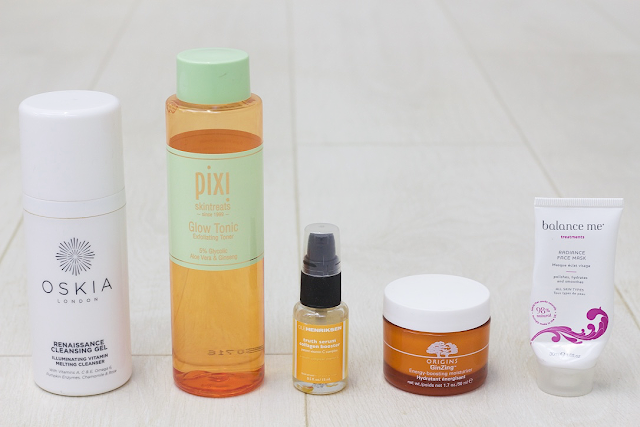 I really want to try the Pixi Glow Tonic and pretty much everything from Oskia! I have tried the Ginzing Moisturiser and I really liked it over the summer because it's so lightweight!